This site is dedicated in helping you to find California Yacht Clubs. 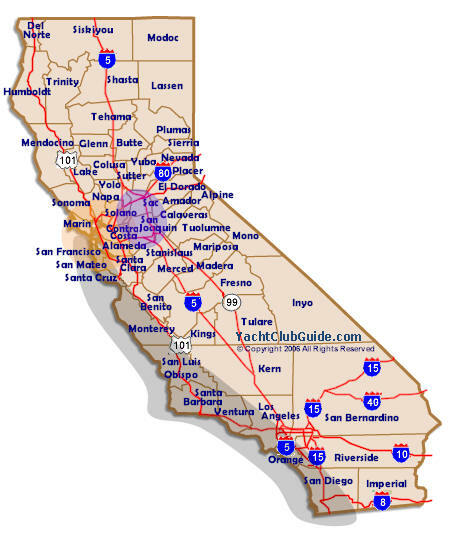 You will find the locations of over 175 California Yacht Clubs. Have access to the Yacht Club's membership power boaters to sail boaters ratio, Yacht Club phone and fax numbers. You will also find out what type of Yacht Club facilities that are available and finally the type of club reciprocity. Most Yacht Club pages have an interactive Yacht Club map that provides with driving directions and even an aerial look of the club house! Find a California Yacht Club fast! This Yacht Club Guide website is segmented into four California regional areas California Delta Yacht Clubs, San Francisco Bay Area Yacht Clubs, Southern California Yacht Clubs and Northern California Yacht Clubs. Find a California Yacht Club fast by clicking on the Yacht Club Search tab to the left. California Yacht Clubs provide a boater an opportunity to join other boating enthusiasts with the same passion. Whether be power boating, sail boating, socializing or learning to boat the clubs can enhance the adventure of pleasure boating.